Visit their website for more info and photos. The Latah Foundation spear headed this rail-to-trail. It goes from Moscow to Troy and is free of motorized vehicles. It is a great trail for roller blading / scootering /biking with your best friend since it is paved. It starts near the UI fountains in Moscow where 95 and 8 meet. The trail follows the Troy Highway the majority of the way to Troy! “The 12-mile trail between Moscow and Troy was completed in October 2008. It is a fully paved, 10-foot wide trail intended for use by pedestrians, bicyclists, in-line skaters, wheel-chair operators, cross-country skiers and others with non-motorized transportation. 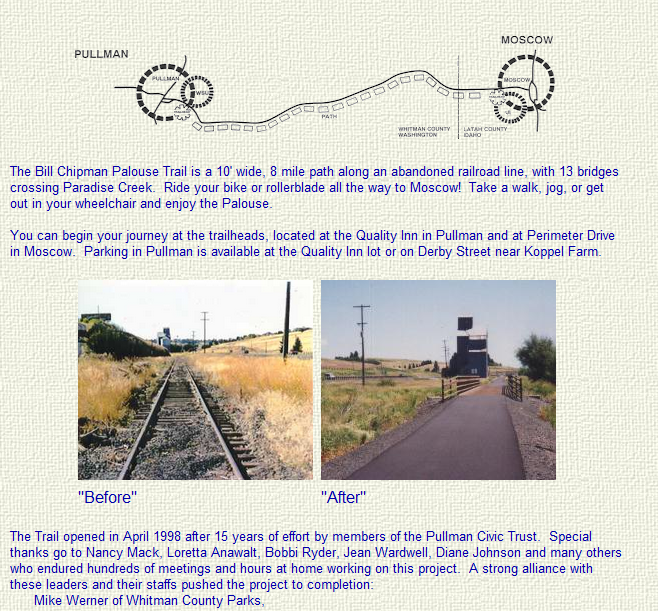 In August 2009, Latah County acquired ownership of the old rail bed continuing 4 miles southeast of Troy. This next section of trail is currently an unimproved gravel/rock pathway that follows Bear Creek.” From TrailLink.com. Have you used this trail? Visit the website above for maps and more information. Have you hiked here? Post your photos!